Counsel Office for the year ended 30 June 2008. This is the report of the Parliamentary Counsel Office (PCO) for the 2007/08 year. In preparing the report, the PCO has followed the guidance provided by the Treasury.1 This Annual Report, together with the PCO’s Statement of Intent,2 form the components of the Managing for Outcomes framework. This year has been a year of significant achievement, delivery, and change for the PCO. The breadth of outcomes and the high quality work involved in delivering them are a tribute to the creativity and dedication of the whole PCO staff. The PCO drafted 66 Government Bills (including two Members’ Bills) and 427 Statutory Regulations in the financial year ended 30 June 2008. Associated with the conclusion of the PAL Project, the New Zealand Legislation website—a new, permanent legislation website at www.legislation.govt.nz (replacing the Interim Website)—was launched in January 2008 to provide free public access to legislation. The process of officialising6 the content of the legislation website commenced in the latter part of the 2007/08 year and all the legislation for 2007 (other than the Income Tax Act 2007) was checked and officialised. Fourteen Acts and two Statutory Regulations were issued as official reprints in addition to the legislation on the website that was officialised during the year. PCO staff worked closely with the Law Commission, the Legislation Advisory Committee, and the Legislation Design Committee to improve the quality, clarity, and accessibility of New Zealand legislation. Parliamentary Counsel continued to provide assistance with the development of advanced legislative drafting training for Pacific Island states in collaboration with the Pacific Forum and Commonwealth Secretariats. 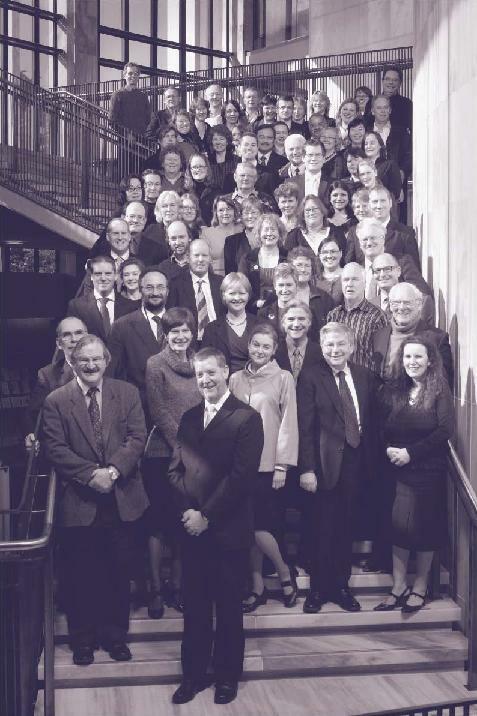 The PCO hosted the New Zealand Law Librarians’ Association Symposium in June 2008. Also in June, the PCO made a first transfer to Archives New Zealand of a substantial amount of archival material representing a significant contribution to the understanding of the political and legislative history of New Zealand. The contract for the print and retail sales of New Zealand legislation was re-tendered. It has been the practice of successive governments to adopt a legislation programme for the drafting of Bills in each calendar year, but no formal programme exists for the drafting of regulations. Bills are assigned categories on the legislation programme according to their legal and policy importance. The programme changes throughout the year as Bills are added to, or taken off, the programme, and delays in making policy decisions can delay the drafting of Bills. The PCO expects to draft all category 1 and 2 Bills for which instructions are received. As at 30 June 2008, the PCO had drafted six of those seven category 1 Bills and 29 of those 35 category 2 Bills. As at the same date, the PCO had drafted 38 of those 60 category 3 Bills, one of those 56 category 4 Bills, but had not received instructions for any of those 29 category 5 Bills. The PCO maintained a very constructive relationship with the Law Commission and during the year has seconded a Deputy Chief Parliamentary Counsel to assist it with legal research and drafting. The Waka Umanga (Māori Corporations) Bill, which was before the House as at 30 June 2008, arose from a Law Commission proposal and was drafted by the PCO. The Property Law Act 2007 and Sentencing Council Act 2007, which were both passed in the year under review, arose from Law Commission proposals and were drafted by the PCO. The PCO itself is the subject of a Law Commission review in the form of a review of the Statutes Drafting and Compilation Act 1920 and the associated work of the Commission on the presentation of New Zealand Statute Law and associated legislation (such as the Acts and Regulations Publication Act 1989). PCO senior management, Parliamentary Counsel, and other staff have contributed to both of these reviews during the course of the year. The Chief Parliamentary Counsel is a member of the Legislation Advisory Committee (LAC) established by the Minister of Justice in 1986, and the Legislation Design Committee (LDC) established by Cabinet in June 2006. The LAC advises the Government on good legislative practice and scrutinises the legislative work of the Government, making submissions to select committee where appropriate. The LDC advises departments on the appropriate legislative architecture for significant or complex policy proposals requiring legislation. Parliamentary Counsel have been heavily involved in assisting both committees achieve their outcomes this year. In the year under review, 427 Statutory Regulations were made. In the calendar year 2007, 408 Statutory Regulations were made. In general, Acts of Parliament contain the main policy components of a legislative regime while Statutory Regulations contain much of the essential detail and administrative mechanisms to make the Act work. It is often through such delegated legislation that a legislative regime has its greatest impact. All proposed Statutory Regulations that are to be made by the Governor-General in Council are considered by the Cabinet Legislation Committee and by Cabinet before they are submitted to the Governor-General in Executive Council. Unlike the drafting of Bills, drafting Statutory Regulations and other legislative instruments can give rise to complex legal questions about whether there is power to make the regulations or instrument under the relevant Act. Parliamentary Counsel are required to certify whether proposed Statutory Regulations are in order for submission to Cabinet, that is, whether there is any question about their vires and whether there is any ground on which they may be challenged under the Standing Orders of the House or disallowed under the Regulations (Disallowance) Act 1989. Seventy-five exemption notices were drafted for the Securities Commission under the Securities Act 1978 and the Securities Markets Act 1988 and for the Takeovers Panel under the Takeovers Act 1993. These notices can be complex instruments and are often required at short notice. The PCO accords high priority to the requirements of the Commission and the Panel in this regard. The PCO assists the Rules Committee, established under section 51B of the Judicature Act 1908. Rules of practice and procedure for the Supreme Court, Court of Appeal, High Court, and District Courts are made by the Governor-General by Order in Council with the concurrence of the Rules Committee. In the period under review, the PCO provided advice and legislative drafting services to the Rules Committee. This work included drafting amendments to the High Court Rules and District Courts Rules, and the preparation of draft revisions of those rules. The PCO’s goal for clear drafting is continuous improvement. During the development and commissioning phases of the New Zealand Legislation system, some changes were made to format and amending styles. Now that the NZL system is operational, it is expected that further progress will be possible in this area. For example, it may be possible to simplify the amending style in legislation that amends other enactments, and to improve the structure of amending enactments. The guidance material available to PCO staff involved in drafting legislation includes the PCO Style Manual (which was fully revised in 2006) and the PCO Drafting Manual (which is nearing the end of a comprehensive review). The PCO’s Guide to Working with the Parliamentary Counsel Office was revised and reissued in March. It provides guidance to assist departmental officials when instructing Parliamentary Counsel to draft legislation. This guide helps departments to work effectively with the PCO, particularly when giving instructions and responding to drafts. The Chief Parliamentary Counsel and other Counsel have also presented seminars on the subject to departmental officials and wider audiences this year. The subject matter of advice given by Parliamentary Counsel varies enormously. The context in which advice is sought is generally a specific piece of existing legislation or proposed legislation, but may include questions of drafting practice, the application of the LAC Guidelines, general legal principles, Cabinet procedure, parliamentary procedure, the effect of court decisions, and statutory interpretation. The PCO also arranged for the production of a more comprehensive index to the LAC Guidelines to assist departments’ use of the guidelines when instructing the PCO. The Chief Parliamentary Counsel has participated in the Australasian Parliamentary Counsel’s Committee, particularly with regard to issues relating to common drafting approaches, access to legislation, and benchmarking measures. In addition, a Parliamentary Counsel attended the Commonwealth Association of Legislative Counsel Conference and the Commonwealth Law Conference in September 2007. The following graphs compare the number of Government Bills drafted and published and Statutory Regulations made and published, plus the numbers of SOPs drafted and published, in the financial years ending 30 June 2004 to 30 June 2008. In the financial year under review, the following significant Bills were introduced and significant Acts passed. This PCO-drafted legislation can be viewed on the New Zealand Legislation website (www.legislation.govt.nz). The PAL Project was designed to improve the way in which New Zealand legislation (Bills, Acts, Statutory Regulations, and Supplementary Order Papers (SOPs)) is handled in the drafting stages and made available to the public. The aim of the project was to provide public access to up-to-date official legislation in both printed and electronic forms. This project is now complete. The project was implemented within the PCO, IRD, and Office of the Clerk in November 2007 and the New Zealand Legislation website (www.legislation.govt.nz) was launched in mid-January 2008. Electronic versions of draft and enacted legislation are now freely available via that internet site. The PCO has continued its commercial arrangement with the Knowledge Basket website,8 which provides access to historical legislation. Following the successful launch and full operation of the new website, the Interim Website of New Zealand Legislation was withdrawn on 30 June 2008. The PAL Project implemented a complete, end-to-end, drafting, processing, and publishing system for the PCO. Working with a new XML authoring tool (Epic Editor) to draft and publish legislation is now becoming business-as-usual for the PCO and the other agencies affected by the changes. The PCO is committed to continuing to make enhancements to the system, taking into consideration the demands from Parliament, the public, and other external stakeholders, as well as ensuring that our main users in the PCO, IRD, and Office of the Clerk gain as much efficiency as possible. The system’s first major new release after go-live was successfully implemented at the beginning of June. As with all major government IT projects, it has been necessary to undertake a formal post-implementation review. The normal time frame for such reviews is three to six months after implementation and their purpose is to assess and review the completed solution, determine whether or not the benefits have been achieved, and highlight what has been learned. This particular review will also consider the governance structures that have been set up to manage the PCO’s information systems, and make recommendations as appropriate. The final report is due early in the 2008/09 financial year. The PCO’s contract with Legislation Direct (LD) to provide prepublication services for legislation ended on 29 February 2008. The PCO’s own Prepublication Unit (PPU) took over responsibility for all of the prepublication and publication functions that were previously undertaken by LD, and it also publishes legislation to the New Zealand Legislation website. reprints of Acts and regulations. During the reporting period, the Reprints Unit published 3,732 pages of reprinted legislation (14 reprinted Acts and two reprinted Statutory Regulations). 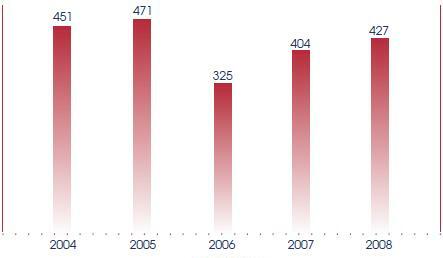 This reduction in volume from the 2005–2007 levels arises from concentration on the other priority activities of the Reprints Unit during the year. This meant that the PCO successfully updated the data for the New Zealand Legislation website in preparation for the launch of the site in January 2008, and then embarked on the PCO’s officialisation project to verify that all principal Acts and Statutory Regulations on the legislation website are accurate and that any amendments made to them have been compiled appropriately. “Officialisation” of the website content is currently expected to take at least three years to complete. In the reporting year, the PCO Reprints Unit completed the officialisation of 207 items of legislation, comprising all 2007 Acts and Statutory Regulations (apart from the Income Tax Act 200710) and 19 Acts and Statutory Regulations from 2006. The Tables of New Zealand Acts and Ordinances and Statutory Regulations, and Deemed Regulations in Force (the Tables) as at 1 January 2008 were published in February 2008. This is the first edition of the Tables to include information on deemed regulations and the agencies who produce them. The cut-down electronic version was also updated to 1 January 2008, but was removed from the PCO website on 31 March 2008 as it was a duplication of information now provided on the New Zealand Legislation website. In December 2007, the PCO invited organisations to register their interest in the printing, storage, and distribution of Bills, Acts, Statutory Regulations, and related documents with effect from 1 August 2008, for a minimum period of three years. Tender documents were sent to all those who registered an interest. An evaluation panel, with the assistance of specialist advisers, analysed the completed tender documents. SecuraCopy (a trading division of Blue Star Group) was selected as the preferred tenderer and detailed contract negotiations are currently in progress. The PCO is in contact with other agencies on access to legislation matters, monitoring developments in those other jurisdictions, and sharing information and knowledge. As anticipated, the number of enquiries received by the PCO since the go-live of the New Zealand Legislation website has increased substantially. 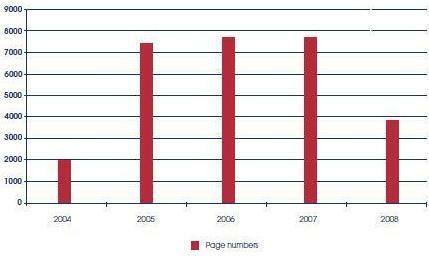 For the period 1 January to 30 June, three times more enquiries were received in 2008 than in 2007. The enquiries have been responded to using existing PCO resources. 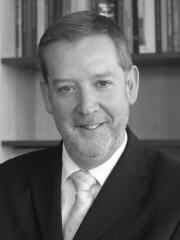 Following on from the appointment of David Noble as Chief Parliamentary Counsel in November 2007, a restructured Senior Management Team was created of Ian Jamieson as Deputy Chief Parliamentary Counsel (with responsibility for the legislative drafting and editing group), the newly appointed Paul de Wijze as Chief Information Officer (responsible for the access to legislation and IS group), and the Corporate Services Manager17 (responsible for the corporate services group). An Organisational Development and Human Resources Adviser has also been appointed (as recommended in the PricewaterhouseCoopers review18). A strategic human resources plan has been developed for implementation commencing from the beginning of 2008. Revised and clearer staff reporting lines were introduced, also in early 2008 (see the chart below). The HR strategic plan identifies a number of major areas for reform, for example the performance appraisal and remuneration systems. It also included new initiatives for the PCO such as the GALLUP Q12 staff engagement survey and a Department of Labour Pay and Employment Equity Review (PEER). During April the GALLUP Q12 staff engagement survey was administered with a 90% return rate, followed by teams reviewing their results and establishing action plans to be implemented over the 2008/09 year. The PEER review was successfully completed by 30 June 2008 (the shortest time for a PEER review) after a consultative approach by a committee consisting of staff representatives from across the PCO and a PSA representative. The PEER report was presented to the Chief Parliamentary Counsel and the Senior Management Team and the recommendations have since been accepted and their implementation is being coordinated with the HR strategic plan. Some recommendations that arose during the course of the review were implemented immediately by the Chief Parliamentary Counsel. Research has commenced on the development of a competency framework for all positions in the PCO. A new policy has been adopted covering KiwiSaver superannuation, and work has commenced on producing an HR manual for the PCO, creating a PCO job description template, and developing a personal records policy. 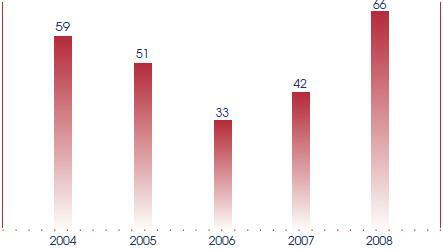 This year has seen staff turnover increase to 15% (turnover was 7% in the 2006/07 year). This includes one Parliamentary Counsel who retired after 31 years’ service with the PCO, two staff members choosing not to return from parental leave, two Parliamentary Counsel moving to other legal posts in the New Zealand public service, and eight other staff resigning over the course of the year. The PCO has also instituted a secondment and exchange programme. In April a Parliamentary Counsel from the PCO exchanged posts with a member of the Office of Parliamentary Counsel in London for a year, and in March the Deputy Chief Parliamentary Counsel (Access) began a secondment to the Law Commission. The transition to the new drafting, processing, and publishing system (NZL system) following its in-house launch in November 2007 was smooth, as the office moved from project mode to business-as-usual. Staff training was completed satisfactorily, and the new methods and procedures have been successfully incorporated into regular PCO operating procedures. The completion of the PAL Project produced a milestone in accessible and networked state services. The PCO has demonstrated its commitment to being an employer of choice and a contributor to excellent State services through the GALLUP Q12 staff engagement survey, the PEER review, and the successful recruitment of high quality legal drafting, IT, and other staff during the course of the year. Work now planned on the review of competencies and leadership development will also contribute to these goals. An example of coordinated State agencies is the PCO’s effective contribution to, and cooperation with, both the LAC and LDC through the Chief Parliamentary Counsel and other Counsel in the PCO, together with instructing departments, to ensure that legislation achieves the desired outcomes. And finally the PCO’s contribution to the goal of trusted State services is reflected in the feedback received from the agencies instructing the PCO, including Judges on the Rules Committee and MPs on select committees. The PCO is establishing an Audit and Risk Committee with external representation and is planning to hold the first meeting of the committee in the first half of the new financial year. Work is also progressing on developing a risk management framework and methodology for the PCO, which when implemented in the 2008/09 financial year will be the subject of regular reporting to the Audit and Risk Committee. In May 2008, the PCO implemented a formal records policy and reviewed the existing retention and disposal schedules. This will lead, in the 2008/09 financial year, to an application to Archives New Zealand for a revision of the PCO’s retention and disposal schedules. All of these are necessary steps toward full compliance with section 17 of the Public Records Act 2005, and Archives New Zealand’s Create and Maintain Standard. At the end of the reporting year, the PCO completed its transfer of all hard-copy administrative files of permanent value and all legislative drafting files closed before 1 January 1998 to Archives New Zealand. These comprise files formally scheduled for permanent retention as archives, as required by the PCO’s current retention and disposal schedules, Archives New Zealand’s General Disposal Authorities, and the Public Records Act 2005. The financial statements of the PCO for the year ended 30 June 2008, including the Statement of Service Performance, now follow. In our opinion, the financial information presented in the Statements and Notes to the Financial Statements fairly reflects the position and operations of the PCO. In terms of the Public Finance Act 1989, I, David Noble, Chief Parliamentary Counsel, accept responsibility for the preparation of the financial statements and the judgements used in the financial statements. The accompanying Notes to the Financial Statements form part of these financial statements. For information on major variances against budget, refer to Note 23. The PCO has accommodation and car park leases with the Reserve Bank. The PCO has a contract with Unisys New Zealand Ltd for the maintenance and support of the NZL system. The PCO has a contract with Brookers to maintain the PCO database. The PCO has no finance lease arrangements. The cleaning contract has not been disclosed as it is not significant in value. 1 This includes adjustments made in the Supplementary Estimates and transfers under section 26A of the Public Finance Act 1989. The PCO is a government department as defined by the Public Finance Act 1989. These are the financial statements of the PCO for the year ended 30 June 2008, which have been prepared pursuant to the Public Finance Act 1989. The PCO is a public benefit entity. Its primary objective is the drafting and publishing of legislation. The financial statements have been authorised for issue on 22 September 2008 by the Chief Parliamentary Counsel and the Corporate Services Manager. These financial statements have been prepared in accordance with, and comply with, NZ IFRS as appropriate for public benefit entities. This is the first set of financial statements prepared using NZ IFRS and comparatives for the year ended 30 June 2007 have been restated to NZ IFRS accordingly. Reconciliations of equity and net surplus/(deficit) for the year ended 30 June 2007 under NZ IFRS, to the balances reported in the 30 June 2007 financial statements, are detailed in Reconciliation of taxpayers’ funds as at 30 June 2007. The financial statements are presented in New Zealand dollars and all values are rounded to the nearest thousand ($000). New Zealand dollars is the PCO’s functional currency. NZ IAS 1 Presentation of Financial Statements (revised 2007) replaces NZ IAS 1 Presentation of Financial Statements (issued 2004) and is effective for reporting periods beginning on or after 1 January 2009. The revised standard requires information in financial statements to be aggregated on the basis of shared characteristics and to introduce a statement of comprehensive income. The budget figures are those presented in the Budget Night Estimates (Main Estimates) and those amended by the Supplementary Estimates and any transfer made by Order in Council under the Public Finance Act 1989. Significant financial difficulties of the debtor, probability that the debtor will enter into bankruptcy, and default in payments are considered indicators that the debtor is impaired. The amount of the impairment is the difference between the asset’s carrying amount and the present value of estimated future cash flows, discounted using the original effective interest rate. The carrying amount of the asset is reduced through the use of an allowance account, and the amount of the loss is recognised in the schedule of departmental expenses. When a debt is uncollectable, it is written off against the allowance account for debtors. Overdue receivables that are renegotiated are reclassified as current (ie not past due). A finance lease is a lease that transfers, to the lessee, substantially all of the risks and rewards incidental to ownership of an asset, whether or not title is eventually transferred. At the commencement of the lease term, the PCO recognises finance leases as assets and liabilities in the Statement of Financial Position at the lower of the fair value of the leased item or the present value of the minimum lease payments. The amount recognised as an asset is depreciated over its useful life. If there is no certainty as to whether the PCO will obtain ownership at the end of the lease term, the asset is fully depreciated over the shorter of the lease terms and its useful life. The initial cost of property, plant, and equipment is the value of the consideration given to acquire or create the asset and any directly attributable costs of bringing the asset to working condition for its intended use. Gains and losses on disposals are determined by comparing the proceeds with the carrying amount of the asset. Gains and losses on disposal are included in the Statement of Financial Performance. When revalued assets are sold, the amounts included in asset revaluation reserves in respect of those assets are transferred to taxpayers’ funds. Donated assets, with or without conditions, are valued at fair market value and recognised as revenue when control over the asset is obtained. Provision is made in respect of the PCO’s liability for annual, long service, retirement, and sick leave. Annual leave has been calculated on an actual basis at current rates of pay. Long service and retirement leave have been calculated on an actuarial basis based on the present value of expected future entitlements. Sick leave has been calculated on the past history of sick leave taken by all employees for the last three years to derive the average amount of accrued sick leave taken over and above the entitlement for the year. Sick leave has been actuarially assessed. The PCO belongs to the Government Superannuation Fund (GSF). GSF is a defined benefit plan. It has been determined that the scheme is fully funded and as such no liability exists to be recognised by the PCO. Obligations for contributions are recognised as an expense in the Statement of Financial Performance as incurred. Foreign currency transactions are converted at the New Zealand dollar exchange rate at the date of the transaction. When a forward exchange contract has been used to establish the price of a transaction, the forward rate specified in that foreign exchange contract is used to convert the transaction to New Zealand dollars. Foreign exchange gains and losses resulting from the settlement of such transactions and from the translation at year end exchange rates of monetary assets and liabilities denominated in foreign currencies are recognised in the Statement of Financial Performance. Revenue and expenses in relation to all financial instruments are recognised in the Statement of Financial Performance. Where the PCO enters into foreign currency forward contracts to hedge foreign currency transactions, any exposure to gains or losses on these contracts is generally offset by a related loss or gain on the item being hedged. Government departments are exempt from the payment of income tax in terms of the Income Tax Act 2004. Accordingly, no charge for income tax has been provided for. Future expenses and liabilities to be incurred on contracts that have been entered into at balance date are disclosed as commitments to the extent that they are equally unperformed obligations. Commitments relating to employment contracts are not disclosed. This is the Crown’s net investment in the PCO. Taxpayers’ funds comprise revaluation reserves and general funds. There are no changes in accounting policies, including cost allocation policies, beyond those arising on transition to NZ IFRS and explained in Reconciliation of taxpayers’ funds as at 30 June 2007. The PCO financial statements for the year ended 30 June 2008 are the first financial statements that comply with NZ IFRS. The PCO has applied NZ IFRS 1 in preparing these financial statements. The PCO’s transition date is 1 July 2006. The PCO prepared its opening NZ IFRS balance sheet at that date. The reporting date of these financial statements is 30 June 2008. 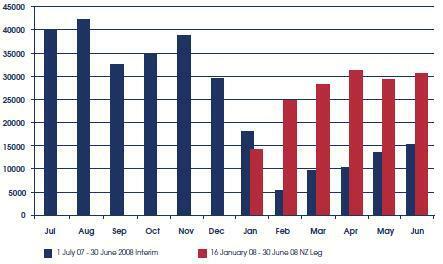 The PCO’s NZ IFRS adoption is 1 July 2007. In preparing these financial statements in accordance with NZ IFRS 1, the PCO has applied the mandatory exceptions and no optional exemptions from full retrospective application of NZ IFRS. Estimates exemption—estimates under NZ IFRS at 1 July 2006 and 30 June 2007 are consistent with estimates made for the same date under previous NZ GAAP. The following table shows the changes in equity resulting from the transition from previous NZ GAAP to NZ IFRS as at 1 July 2006 and 30 June 2007. Intangible assets: computer software was classified as part of plant and equipment under previous NZ GAAP. The NZL system was classified under work in progress. Addition of provision for sick leave: sick leave was not recognised as a liability under previous NZ GAAP. NZ IAS 19 requires the PCO to recognise employees’ unused sick leave entitlement that can be carried forward at balance date, to the extent that the PCO anticipates it will be used by staff to cover future absences. 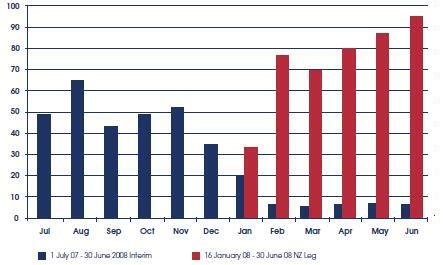 Reported surplus for the year ended 30 June 2007 increased by $28,000 as a result of transition to NZ IFRS. This is due to the reduction in sick leave provision based on the valuer’s report. This is not reflected in the provision for repayment of surplus, as that repayment is based on previous NZ GAAP. There have not been any material adjustments to the Statement of Cash Flows for the year ended 30 June 2007, on transition to NZ IFRS. The PCO pays a capital charge to the Crown on taxpayers’ funds held as at 30 June and 31 December each year. The capital charge rate for the year ended 30 June 2008 was 7.5% (2007: 7.5%). The PCO had not yet been reimbursed for these payments at balance date. The amounts outstanding are current (less than 30 days). The asset valuation was completed in accordance with NZ IAS 38 Intangible Assets. The asset was valued by PricewaterhouseCoopers as at October 2007. The NZL system’s value has been assessed based on the appropriateness of the costs incurred to date and the valuer’s knowledge of the market. In estimating the useful life of the system the valuer has taken a prudent approach based on the useful life of similar assets in other government entities. All intangible assets are internally generated; therefore no separate disclosure is required for this asset category. The PCO has not entered into any finance leases. All leases are shown GST exclusive. Reserve Bank office lease: This lease is for the rental of office space on floors 4, 12, and 13 plus basement storage in the Reserve Bank building. The lease has a make-good provision where the lessee can either surrender the fit-outs and alterations to the lessor or remove these and make good. This lease is noncancellable. Reserve Bank car park leases: These leases are for the rental of car park spaces in the Reserve Bank building and the adjoining building located on the corner of Mowbray and Bolton Streets. These leases are cancellable on the anniversary date. There are no escalation clauses on the leases. The Reserve Bank office lease has renewal dates of 15 April 2010 and 15 April 2013. This lease has an expiry date of 14 April 2016. The car park leases have renewal dates of 15 April 2010 and 15 April 2013. These leases have an expiry date of 15 April 2016. None of the leases have purchase options, so are operational leases by nature. The car park leases are automatically renewed annually unless a notice to cancel is provided. discount rate: 6.4% per annum (30 June 2007: 6.8%). Contingent liabilities are separately disclosed in the Statement of Contingent Liabilities. The PCO does not hold any derivative financial instruments. In the normal course of its business, credit risk arises from debtors, deposits with banks, and derivative financial instrument assets. The maximum exposure from trade debtors is the value of the non-government debtors, ie $nil. Default is considered by management to be unlikely and the probable exposure has been determined as negligible. 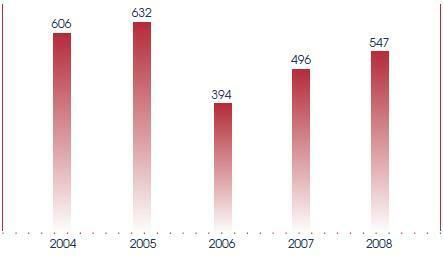 There were no changes in receivables or payables during the year that can be attributed to credit risk. The PCO does not require any collateral or security to support financial instruments with financial institutions that it deals with, or with the NZDMO, as these entities have high credit ratings. For its other financial instruments, the PCO does not have significant concentrations of credit risk. The PCO does not have bank overdraft facilities as at 30 June 2008. In meeting its liquidity requirements, the PCO closely monitors its forecast cash requirements with expected cash draw downs from the New Zealand Debt Management Office. The PCO maintains a target level of available cash to meet liquidity requirements. The PCO is a wholly owned entity of the Crown. The Government significantly influences the role of the PCO as well as being the major source of revenue. The PCO enters into numerous transactions with other government departments, Crown agencies, and state-owned enterprises on an arm’s-length basis. These transactions are not considered to be related party transactions. Those transactions that occur within a normal supplier or client relationship, on terms and conditions no more or less favourable than those that it is reasonable to expect the PCO would have adopted if dealing with that entity at arm’s length in the same circumstances, are not disclosed. No provision has been required, nor any expenses recognised, for impairment of receivables from related parties. Key management personnel include the Chief Parliamentary Counsel and the Senior Management Team. Apart from those transactions described above, the PCO has not entered into any related party transactions and there are no conflicts of interest recorded. The PCO has a policy on conflicts of interest and at each Senior Management Team Meeting any conflicts of interest are recorded. A net surplus of $2.517 million was recorded. This was owing to a number of factors. Significant factors are stated below. There was a surplus of $0.992 million resulting from timing factors associated with the filling of vacant positions, as well as the number of staff on parental leave during the year. There was a surplus of $1.479 million resulting from the costs of printing annual volumes and reprints, and software licences, being less than anticipated. However, additional costs of $0.420 million were incurred in extending the term of Legislation Direct’s obligation to provide prepublication services, owing to delays in the implementation of the NZL system. Additional Crown revenue was provided by Cabinet for ongoing support and maintenance of the NZL system. printing costs for rewritten parts of the Income Tax Act 2007, which was passed in the 2007/08 financial year. The cost of printing was $348,000 (GST exclusive). Total net assets increased by $1.437 million due to the completion of the NZL system. A valuation was carried out by PricewaterhouseCoopers and a total of $10.991 million was capitalised on 16 January 2008. The PCO adopted New Zealand Equivalent to International Financial Reporting Standards (NZ IFRS) for its financial year beginning 1 July 2007. This is consistent with Treasury’s timetable for adoption, and requires NZ IFRS comparative information to be collected and reported from 1 July 2006. The PCO has reviewed the adoption of NZ IFRS and has not identified any significant changes to its results reported under the current Generally Accepted Accounting Practice. The PCO has identified itself as a public benefit entity. The PCO agreed to provide outputs in 2007/08 to meet the requirements of the Attorney-General in terms of their nature, outcome emphasis, quality and quantity specifications, and cost. Contributing to parliamentary democracy under the rule of law by supporting Parliament and the executive in their law-making roles and contributing to the Government’s objectives by ensuring that legislation that is necessary to change the law to implement Government policies is effective, consistent with other legislation, the general law, and international law, and clear; and ensuring that, having regard to the policy of the legislation, it is also consistent with legal principle and with the rights and freedoms protected by the New Zealand Bill of Rights Act 1990 and the Human Rights Act 1993 and, in the case of delegated legislation, that it will withstand scrutiny by the Regulations Review Committee and challenge in the courts and will not be subject to disallowance under the Regulations (Disallowance) Act 1989. 1 Six of the Government Bills were drafted by the Inland Revenue Department; two began as Members’ Bills. 2 Three of the Government Bills were drafted by the Inland Revenue Department; three began as Members’ Bills. 3 Two of the Government Bills before the House of Representatives or awaiting Royal assent at the end of the year were drafted by the Inland Revenue Department. 4 Three of the Government Bills were drafted by the Inland Revenue Department. 1 Report of the Justice and Electoral Committee 2008/09 Estimates Vote Parliamentary Counsel. 2 The PCO is examining further possibilities to improve the quality, structure, and accessibility of legislation with parliamentary authorities and for bench-marking drafting services (Statement of Intent 2008–2011). Contributing to parliamentary democracy under the rule of law by supporting Parliament and the executive in their law-making roles and contributing to the Government’s objectives by ensuring that legislation, including Bills and SOPs, is accessible to the public in both printed and electronic forms, and by providing printed copies of Government Bills and Government SOPs to the House. 1 In this period, the Reprints Unit updated the New Zealand Legislation website for its launch in January 2008, and officialised the 2007 legislation (220 Acts and Statutory Regulations) and commenced work on the 2006 legislation. Bills, SOPs, Acts of Parliament, Statutory Regulations, the annual volumes, reprints, and the Tables of New Zealand Acts and Ordinances and Statutory Regulations, and Deemed Regulations in Force are published in accordance with best industry practice. 1 The PCO is examining further possibilities to improve the quality, structure, and accessibility of legislation with parliamentary authorities and for bench-marking drafting services (Statement of Intent 2008–2011). 1 Three Acts out of 143 took longer than ten working days after assent to be printed and made available in bookshops. One of these Acts was large (2,855 pages) and had to be printed and bound as a five-volume set, and took 35 working days to produce and make available. Unbound proofs of the set were made available for viewing at retail outlets that stock legislation until printed and bound copies became available. Another of these Acts was assented to in the lead up to the Christmas holiday period, and took 16 days to be printed and made available. The third Act took 12 working days to be made available because of the need to correct a printing error. 2 The electronic version of the Tables was withdrawn from the PCO website from 31 March 2008 as the functions previously provided by the electronic version of the Tables are now provided by the New Zealand Legislation website. The Auditor-General is the auditor of Parliamentary Counsel Office (the Office). The Auditor-General has appointed me, John O’Connell, using the staff and resources of Audit New Zealand, to carry out the audit on his behalf. The audit covers the financial statements and statement of service performance included in the annual report of the Office for the year ended 30 June 2008.
its actual revenue earned and output expenses incurred, as compared with the forecast revenues and output expenses outlined in the statement of forecast service performance adopted at the start of the financial year. The audit was completed on 22 September 2008, and is the date at which our opinion is expressed. The basis of our opinion is explained below. In addition, we outline the responsibilities of the Chief Parliamentary Counsel and the Auditor, and explain our independence. We carried out the audit in accordance with the Auditor-General’s Auditing Standards, which incorporate the New Zealand Auditing Standards. We planned and performed the audit to obtain all the information and explanations we considered necessary in order to obtain reasonable assurance that the financial statements and statement of service performance did not have material misstatements, whether caused by fraud or error. Material misstatements are differences or omissions of amounts and disclosures that would affect a reader’s overall understanding of the financial statements and statement of service performance. If we had found material misstatements that were not corrected, we would have referred to them in our opinion. The audit involved performing procedures to test the information presented in the financial statements and statement of service performance. We assessed the results of those procedures in forming our opinion. determining whether all financial statement and statement of service performance disclosures are adequate. We did not examine every transaction, nor do we guarantee complete accuracy of the financial statements and statement of service performance. We evaluated the overall adequacy of the presentation of information in the financial statements and statement of service performance. We obtained all the information and explanations we required to support our opinion above. The Chief Parliamentary Counsel is responsible for preparing the financial statements and statement of service performance in accordance with generally accepted accounting practice in New Zealand. The financial statements must fairly reflect the financial position of the Office as at 30 June 2008 and the results of its operations and cash flows for the year ended on that date. The statement of service performance must fairly reflect, for each class of outputs, the Office’s standards of delivery performance achieved and revenue earned and expenses incurred, as compared with the forecast standards, revenue and expenses adopted at the start of the financial year. The Chief Parliamentary Counsel’s responsibilities arise from sections 45A and 45B of the Public Finance Act 1989. We are responsible for expressing an independent opinion on the financial statements and statement of service performance and reporting that opinion to you. This responsibility arises from section 15 of the Public Audit Act 2001 and section 45D(2) of the Public Finance Act 1989. When carrying out the audit we followed the independence requirements of the Auditor-General, which incorporate the independence requirements of the Institute of Chartered Accountants of New Zealand. In addition to the audit we carried out an assignment during the reporting period being a review of the tender process for the provision of printing services. This assignment is compatible with those independence requirements. Other than the audit and this assignment, we have no relationship with or interests in the Office. This audit report relates to the financial statements of the Parliamentary Counsel Office for the year ended 30 June 2008 included on the Parliamentary Counsel Office's web site. The Chief Parliamentary Counsel is responsible for the maintenance and integrity of the Parliamentary Counsel Office's web site. We have not been engaged to report on the integrity of the Parliamentary Counsel Office's web site. We accept no responsibility for any changes that may have occurred to the financial statements since they were initially presented on the web site. The audit report refers only to the financial statements named above. It does not provide an opinion on any other information which may have been hyperlinked to/from these financial statements. If readers of this report are concerned with the inherent risks arising from electronic data communication they should refer to the published hard copy of the audited financial statements and related audit report dated 22 September 2008 to confirm the information included in the audited financial statements presented on this web site. The PCO is constituted as a separate Office of Parliament by the Statutes Drafting and Compilation Act 1920. The Chief Parliamentary Counsel and Parliamentary Counsel are appointed under the Statutes Drafting and Compilation Act 1920 by the Governor-General on the recommendation of the Prime Minister. Other staff are employed by the Chief Parliamentary Counsel on contract. The Minister responsible for the PCO is the Attorney-General. Under the Output Plan agreed each year by the Attorney-General and the Chief Parliamentary Counsel, the Chief Parliamentary Counsel is required to report quarterly to the Attorney-General. The Chief Parliamentary Counsel is responsible to the Attorney-General for the operations and management of the PCO. 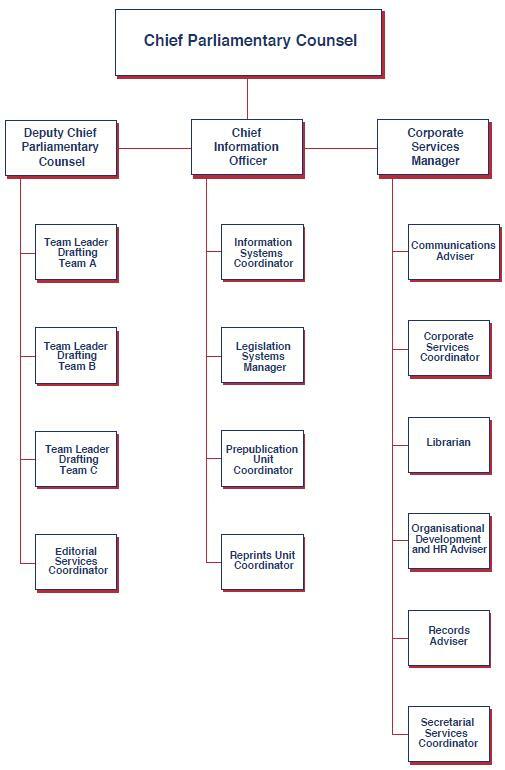 The organisational structure of the PCO, revised during the 2007/08 year, is shown under Organisational health and capability. The PCO has key relationships with a number of other organisations, in particular, the Parliamentary Service, which provides a range of services to the PCO. These include accounting and financial reporting services, payroll and the provision of human resources support, and the parliamentary core computing network. Service level agreements are in place to manage the provision of these services. The PCO works closely with the Office of the Clerk and has developed protocols with that office. The PCO also works closely with the Legislation Coordinator and with the Secretary of the Cabinet Legislation Committee in the Cabinet Office. The PCO fulfils its obligation to publish New Zealand legislation through a contract with SecuraCopy for the printing, distribution, and sale of hard-copy legislation and by publishing direct to the New Zealand Legislation website. The Auditor-General is the auditor of the PCO. The Auditor-General has appointed Audit New Zealand to perform the audit of the PCO on his behalf. Audit New Zealand also undertakes the annual Departmental Internal Control Evaluation (DICE) review on behalf of the Treasury. 1 On 12-month secondment to the Office of Parliamentary Counsel (OPC) in London, England. Nicola Holt from the OPC is at the PCO for the same period. 3 On two-year secondment to the Law Commission. 1Preparing the Annual Report: Guidance and Requirements for Departments 23 June 2008 www.treasury.govt.nz/publications/guidance/accountability/annualreports. 2Statement of Intent Parliamentary Counsel Office for the period 1 July 2007 to 30 June 2010. 4 This is further explained in the Statement of Intent Parliamentary Counsel Office for the period 1 July 2007 to 30 June 2010. 5 This is in accordance with the intention expressed in the Report of the Parliamentary Counsel Office for the year ended 30 June 2007. 6 "Officialisation" refers to the steps necessary to make each principal enactment in the database of legislation on the New Zealand Legislation website an accurate and authoritative version of compiled legislation. 7 See the Report of the Parliamentary Counsel Office for the year ended 30 June 2007 for more on the review. 9 The structure of the New Zealand Legislation website, and the formats it offers, differ from the interim site, making direct comparison difficult. The new site offers PDF versions of documents, which can be downloaded for use offline. The higher bandwidth usage but lower unique visitor numbers may reflect this as PDF files tend to be larger in size. 10 Due to its size and character as a consolidating and amending statute, this Act is currently available on the New Zealand Legislation website in PDF format only. Officialisation of the Act is expected to be completed within the 2008/09 year. 11 Total numbers of enactments reprinted by year ended 30 June: 2004: 11 Acts, 3 Statutory Regulations; 2005: 21 Acts, 35 Statutory Regulations; 2006: 39 Acts, 10 Statutory Regulations; 2007: 35 Acts, 9 Statutory Regulations; 2008: 14 Acts, 2 Statutory Regulations. 13 A paper entitled "Public Access to Legislation: Enhancing the Access Experience" was presented by Geoff Lawn (Deputy Chief Parliamentary Counsel (Access) and PAL Project Director) to the Australia–New Zealand Scrutiny of Legislation Conference, held at Parliament Buildings, Wellington, from 31 July to 2 August 2007 (www.pco.parliament.govt.nz/pal/enhancingaccess.shtml). 14 Performance Information for Appropriations: Vote Parliamentary Counsel (www.treasury.govt.nz/budget/2008/ise/v7/ise08-v7-pia-parcou.pdf); Statement of Intent Parliamentary Counsel Office for the period 1 July 2008 to 30 June 2011. 15Statement of Intent Parliamentary Counsel Office for the period 1 July 2008 to 30 June 2011. 17 Noel Lee accepted the position of Corporate Services Manager in June 2008. 18 See the Report of the Parliamentary Counsel Office for the year ended 30 June 2007.